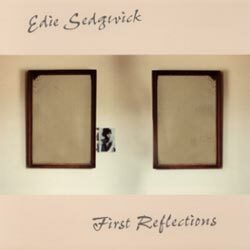 "First Reflections," Edie Sedgwick's debut, is the only document of the original two-piece incarnation of this long-lived project. "Justin Sedgwick," a.k.a. Justin Moyer, plays bass and sings. "Ryan Sedgwick," a.k.a. Ryan Hicks of Panoply Academy Glee Club and later of Measles Mumps Rubella and Suns of Gunz, plays drums. No frills, no drag — just brashly minimal songs about celebrities. As Moyer told the New York Times in 2004: "This is the weirdest album I've ever made." Released in 2001 by Mud Memory in conjunction with Dischord.